Update: Denise Konkel is the winner. Thanks to everyone who entered! 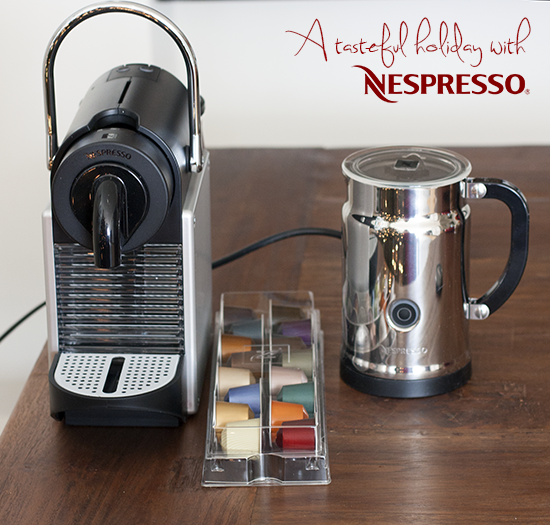 Nespresso recently asked me to share what "a tasteful holiday" means to me, and I can't get past the idea of an evening spent at home with a few friends. Don't get me wrong, New York City is all kinds of merry and bright this time of year, but I really treasure a night in without the cold and crowds. I love serving up easy comfort food like a stew, and it's always necessary to have something sweet on hand, like my new favorite vanilla almonds or peppermint meringues. But what I've found really brings home the coziness and cheer is a holiday drink. It's the perfect way to end an evening. Serve it after dinner when everybody's cozy in the living room, and your guests may never leave. There are so many possibilities this time of year, and I like to cover all my seasonal bases: mulled wine, hot chocolate, apple cider, egg nog, milk punch, and the latest addition to my repertoire, warm, frothy lattes and cappuccinos topped with a little nutmeg. I've pondered buying an espresso machine before but thought they seemed intimidating, not to mention the amount of counter space required. But I've discovered my solution with Nespresso's Pixie. 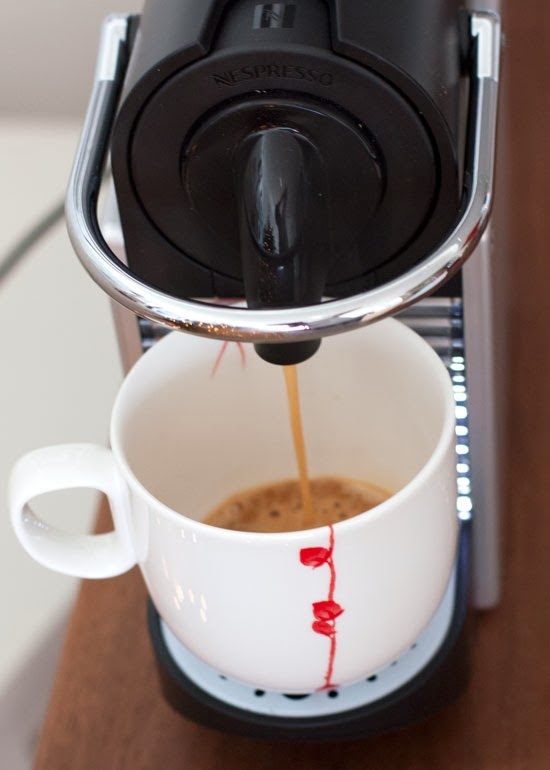 It's sleek, compact and makes delicious espresso for all my favorite coffee drinks. It's making this tasty time of year even tastier. 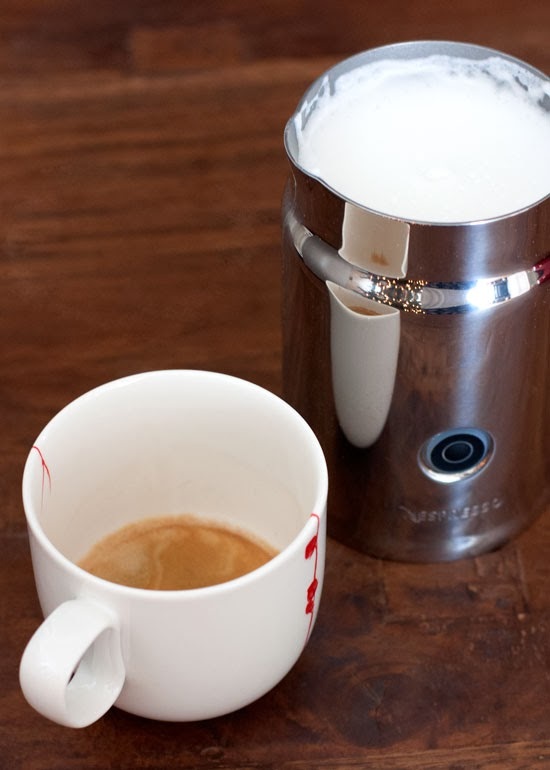 Lucky for you, Nespresso is generously offering one SoHo reader the Pixie Aluminum ($229), the Aeroccino milk frother ($99) and an assortment of coffee capsules! Just leave a comment below telling me what "a tasteful holiday" means to you. Leave your comment before 11:59pm ET on Thursday, January 2. One winner will be chosen at random. Good luck and Happy Holidays! A tasteful holiday means a houseful of good friends and family and a table full of good eats and drinks. packing up some hot drinks, bundling up and heading to stroll down 5th ave to see all of the holiday lights with good friends and good cheer! a classy date night out wit my boyfriend! Christmas day french toast (with some of the homemade challah bread I make) and a big cup of coffee with my boyfriend. In our pajamas, obviously! A tasteful holiday means enjoying lots of little traditions. For my family this includes baking cherry squares and monkey bread while drinking cream soda or hot chocolate. A tasteful holiday to me is spending time with my sisters, who don't live in the same state as me so I don't get to see them very often. 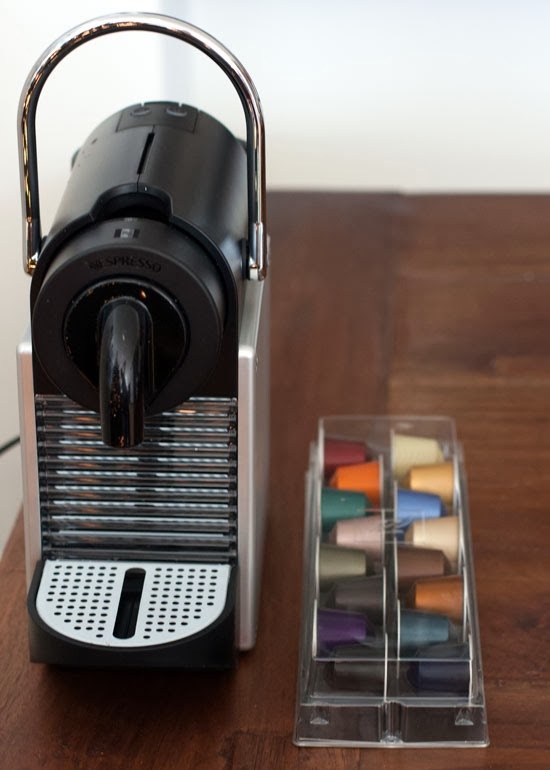 Thanks for the giveaway, Nespresso! A tasteful holiday to me is hot coffee and cinnamon buns fresh out of the oven on Christmas morning. Also, peppermint coffee! Love the look of those meringues. A tasteful holiday are all of the family recipes I look forward to every Christmas. A tasteful holiday to me is sitting around my grandmothers old table in my sisters kitchen - chatting and laughing with family and friends while eating all the wonderful foods and treats everyone has made and sipping on our drink of choice ( which for me is always a cappuccino). Great giveaway! 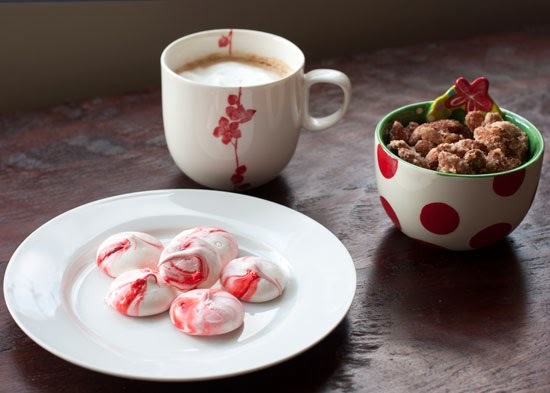 Those peppermint meringues are adorable! and I bet, deliciously with an espresso! family & friends... good food... and some Christmas music! Baking Christmas cookies with my grandchildren….& a nice cup of espresso with frothy milk would be the perfect ending! Ooh what an awesome giveaway! My tasteful holiday is getting dolled up in some sequins and/or tulle and heading to a cozy spot for drinks with friends (irish coffees, perhaps?). :) Happy holidays! A tasteful holiday to me is traditions in the kitchen, by the tree, and by the fire with family and friends. Happy Holidays! Spending my time with my lovely wife and enjoy a cup of coffee! To me, a tasteful holiday is focusing on the things that matter (family, friends, faith, fun). 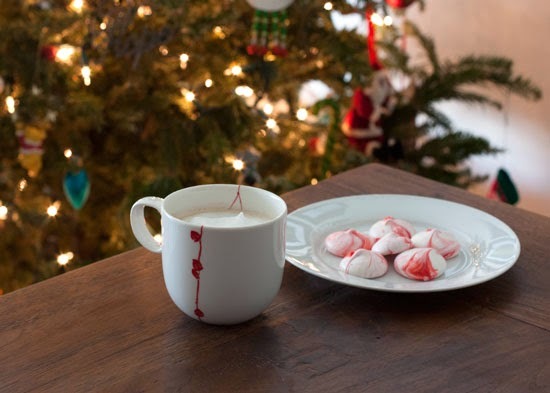 Lovely giveaway, and I'd love to share a homemade latte with my mom who's visiting for the holiday! Christmas brunch with my family! All of us in our pjs while we drink coffee and eat french toast casserole and quiche. Followed by mimosas, of course! An Irish coffee shared with friends! A tasteful holiday for me means a really yummy, quality cookie tray! I love to get them and I really love to make them. Love that Pixie! It's my dream machine top of my want list forever! I agree with you Nat, a tasty holiday is warm comfort food and a favorite dessert like pie or a good cookie spent with people you love. A tasteful holiday means *good* food, not just lots of food! A tasteful holiday for me means lots of family, good smells in the kitchen, a pace that is not set by time, and comfort food all around. Not to mention....in the morning..it has to include a great cup of coffee. A tasteful holiday for me means time with family (mostly in the kitchen) and trips to the mountains! A tasteful holiday is a good old Italian Christmas with fabulous food, friends and family. I love the traditions we have especially during the holidays. They make it so much more fun. What a lovely giveaway! I'm also a NYC transplant. And while I love holidays in the city, a tasteful holiday will always be at "home" outside Philadelphia with my aunt's homemade pizzelle. My family is only second generation American, but the kids (my generation) were raised with mostly American Christmas traditions instead of Italian traditions. Except for the pizzelle. Ahhh... Getting out of bed so early Christmas morning that it's still dark out, watching the kids open their presents from santa, snuggling up by a fire with my hubby, eating a hot bowl of chili, and watching christmas movies. All while still in our Christmas pajamas!! That sounds perfectly tasteful to me! Most of those things (save the chili, unless that's your thing) would totally be made more enjoyable with a nice latte! To me it means excellent coffee and holiday food! And family, of course. a tasteful holiday is making memories with the ones you love! one of my favorite times was Christmas at my Grandma's house- we all played Catch Phrase and it was "old people" vs. "young people" and there was so much laughter and fun. I know it made my Grandma so happy! To me, a tasteful holiday would be waking up on Christmas morning, getting dressed and ready for the day, making a nice big breakfast to share with family before leisurely exchanging gifts. Quite a contrast to Christmases when I was a kid where my sister and I would wake up at the crack of dawn with disheveled hair and pjs tearing into our gifts! It means tranquil, peaceful and filled with family members! Merry Christmas. When I hear "tasteful holiday" I immediately think of my favorite foods that I have every Christmas in Minnesota- sugar cookies, beer bread and artichoke dip, cheesy potatoes, and homemade caramel corn. I love being home with my family and sharing so many meals together over the holidays. A tasteful holiday is always an intimate gathering, whether just a few friends or family or just myself and my husband. I love to cook and put much love into my food preparations. The Pixie and Aeroccino would be a wonderful addition to my kitchen preparations of love! Anyone that knows me, knows I am a lover of fine coffee. I have been wanting this combo for years! Thank you for the chance. A tasteful holiday is wafts of roasted pernil starting at 7 am running through my Domincan neighborhood; it's enjoying authentic Puerto Rican coquito (their version of eggnog); it's neighbors surprising you with tanburines and congas at midnight. This year, I will be making pecan rolls for my family to enjoy with coffee after opening our presents. This is an incredible giveaway! Have a wonderful Christmas with your family! a tateful holiday means making amazing food with my family while watching Christsmas movies - The Santa Clause, Grinch, and Home Alone of course!! A tasteful holiday means spending time with the people you love be it family, friends, or both. It's having great food, great conversation, and having lots of fun with each other. Most importantly it's remembering why you have gathered together, so for my family that would be to celebrate the birth of Jesus Christ. Merry Christmas everyone! A tasteful holiday for me means making our own traditions. We serve a variety of both Korean and American foods and love mixing different flavors. A tasteful holiday to me is spending quality time with my daughter and grandchildren. It's enjoying the simple things of the holidays like baking cookies with my grandsons, or reading a Christmas book to them. I like to stay indoors and just relax with my family during the holidays.